KATHMANDU, Feb 11: Nepal Stock Exchange (Nepse) index shed another 68.27 points this week to close at 1,296.23 points on Thursday -- the last trading day of the week. The stock market retreated below the 1,300-level as investors panicked with the margin calls from bank and financial institutions (BGIs) scrambled to offload their shares. A margin call forces the investor to either liquidate his/her position in the stock or add more cash to the account. According to investors, BFIs, who are reeling under acute shortage of loan-able funds, have intensified margin calls to demand further cash or deposits to cover the losses of the stock value in recent days. The decision to completely halt lending due to 'credit crunch' has further worsened the situation. “The fund in the stock market is drying up while many investors are making efforts to exit the market due to tightening of funds by the BFIs. 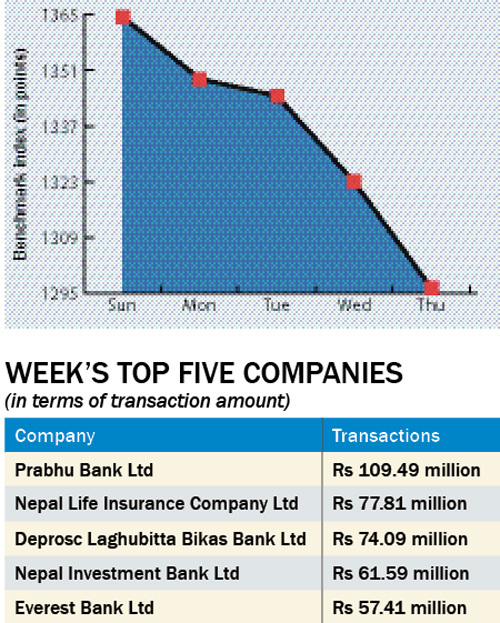 The scrambling of some investors, who have borrowed from banks to finance their stock market trading, have created panic among other investors,” a stock broker told Republica. “While there is massive selling pressure due to margin calls, new investors, who want to make investment of their savings, are not tempted to come to the bearish stock market when BFIs are offering interest rates of as high as 13 percent,” he added. Listing of bonus shares and rights issue is the other reason behind stock market dive. Bank and financial institutions, and insurance companies, who dominate the stock market, have been offering high stock dividend and floating rights issue and follow on public offering (FPO) which was also a major factor in fuelling the bull run some months ago as investors were buying shares in anticipation of rights and bonus shares. All trading groups ended in the red zone this week. Insurance sector was the biggest loser as its sub-index nosedived 551.13 points to close at 5,380 points. Hotels group shed 148.11 points to settle at 1,628 points, while Hydropower ended 68.22 points lower at 1,549.3 points. The sub-indices of Development Bank and Finance groups also went down 57.41 points and 23.57 points, respectively, to close at 1,388.98 points and 609.14 points. 'Others' group also fell 680.24 points to end the week at 680.24 points. Manufacturing and Processing group, and Trading groups remained unchanged at 2,161.86 points and 206.16 points. 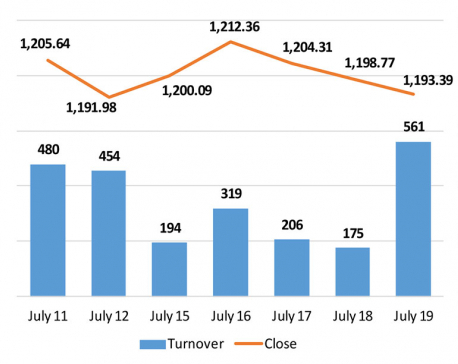 A total of 18.88 million units of shares of 156 companies worth Rs 1.74 billion were traded in the market this week through 200,005 transactions. The turnover is 21.47 percent lower compared to last week. Banking, the heavyweight group, plunged 66.54 points to close at 1,245.97 points.